ABDIJAN, Côte d’Ivoire, Jun 4 2014 (IPS) - Two years ago, it would have taken Catherine Adjoua almost an hour to travel from M’Badon, the isolated fishing area where she lives that has no asphalt roads, to reach her workplace some 13 kilometres away in Abidjan, Côte d’Ivoire’s economic capital. “The travel was harsh, and the old buses very uncomfortable,“ she tells IPS. Thanks to the government’s newly-built asphalt freeway connecting M’Badon to Abidjan, Adjoua’s commute now takes about half an hour — when there is no traffic. The city, which is divided in two parts by the Ebrie Lagoon, has several congestion points, including two bridges and several overpasses. And now it is also an open construction site. An overpass linking the bridge to the highway was open for traffic a month ago, and several other roads and overpasses will soon complement the network. A third bridge is under construction that is set to be inaugurated in December 2014. It was, however, planned in 1995 for traffic of that era but its construction was postponed by the multiple crises affecting the country since then. This West African nation was affected by the recent post-electoral political crisis from 2010 to 2011. More than 3,000 people died in the violence that followed former Ivorian president Laurent Gbagbo’s refusal to concede victory to current President Allassane Ouattara. The construction of a fourth bridge will start in the coming months, the government says. By all appearances, it seems that the vehicle will dictate Abidjan’s development. “There has been an important increase in vehicle traffic in the last years. With the crises, people who couldn’t afford cars indebted themselves to get one,” explains Pierre Dimba, coordinator of the Presidential Emergency Programmes for Infrastructure, a governmental agency responsible for supervising Côte d’Ivoire’s public works. Dimba tells IPS that the crises resulted in many households buying two or three cars as they feared insecurity and felt they would be at risk using public transportation. Abidjan residents also now prefer to live in suburbs, away from central areas that were hotspots of violence during the 2010 to 2011 post-electoral crisis. It resulted in an urban boom, which is yet to be quantified as the country’s first census of 1998 is still ongoing. However it also led to greater congestion on roads that were built well before this suburban development. But the government has a firm desire to develop public transportation. And not only for those who have cars. “We have made it a priority to rehabilitate public transport routes first [after the 2010 to 2011 post-electoral crisis]. Then, we decided to increase connections between living and working areas,” explains Dimba. The impact is already visible for Abidjan’s two million daily commuters. Armand Koffi, a 58-year-old civil servant, can afford a car. But he has a good reason for not driving one: he hates driving. “Abidjan drivers are crazy and aggressive! I prefer sitting, chatting, or reading my book,” he tells IPS. 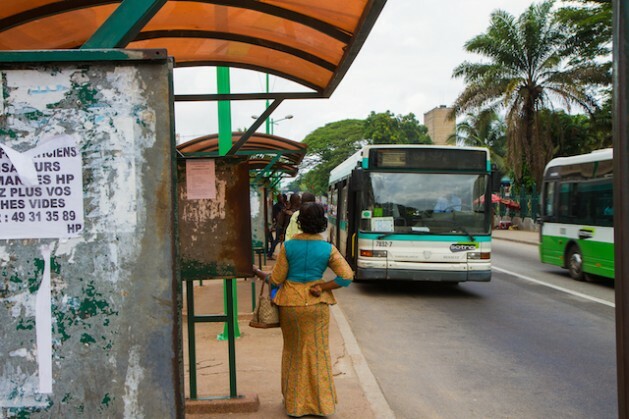 Sotra — the public agency that is 60,2 percent-owned by Côte d’Ivoire’s government and 39,8 percent by a private consortium — has had a monopoly on public transportation within Abidjan since independence in 1960. Legendary singer Lougah François even sang about all the destinations you can go to with Sotra for 50 CFAs (10 cents) in the 1970s. After cumulating a deficit over the years, Sotra is set to see better days. The public agency has an investment of 150 billion CFA (about 300 million dollars) and two-thirds of this will go towards providing new buses and boats. The boats operate on Ebrie Lagoon. So far, it has received about 500 new buses in 2013, with funding for a total of 2,000 buses in 2016, as well as 100 shuttle boats in 2016. Sotra has made several attempts to increase its appeal to civil servants and the middle class, like Koffi. For 25,000 CFA per month (about 50 dollars), he is able to take an express bus from his office to his neighbourhood, with guaranteed seats. Sotra offers lower prices on normal routes, making the price more accessible to the lower income groups. And it has also modified its lines after making a geo-localisation studies of what are the busiest routes. “The government has committed resources for further developments,” explains Dimba. In spite of the expansion plans, Sotra currently owns 20 shuttle boats, running since the 1980s, which offer fast commuting for 100 to 200 CFAs (20 to 40 cents) between four different points on the Ebrie Lagoon. The government has now allowed private owners to run shuttle boats on the lagoon. Turkish firm Yildirim and Ivorian firm SNEDAI will soon launch 45 shuttle boats. Their business interests amount to an investment of 20 billion CFA (about 41.5 million dollars). But the Ivorian government’s commitment to public transportation went a step further when it announced, a month ago, that an urban train will be built in Abidjan. “This infrastructure will solve Abidjan’s traffic jam problems. It will heal the city from important economic loss,” said Transport Minister Gaoussou Touré. The train will cost 650 billion CFA (about 1.4 billion dollars), and will be paid for by a consortium consisting of French group Bouygues and two Korean firms; Dongsan Engineering and Hyundai Rotem. A portion of existing rails will open up for commuters by 2017. About 37 railways will connect the country, with a terminus at Abidjan’s airport. It is planned to transport 300,000 commuters per day. For the young man and his group of buddies in brown uniforms, there are no express buses. Their bus fare may cost only a monthly 3,000 CFA (about six dollars), but they have to fight for a place in an overpacked bus. “We call it the Sardine line,” jokes one his friends. A few metres from where he stands, a train station will be built. “It is good news, but we will be old when it starts to run. I was not even born when they started to work on the third bridge,” adds Kodjo, another friend.